Para USA makes 1911’s that range from $600 to $1600 for every purpose from basic range guns to professional quality match pistols. The Para Elite Officer is intended to take on the concealed carry task. Para is owned by Freedom Group, the same firearms group that owns Remington, Marlin and others. Since buying Para in 2012, they brought in master 1911 smiths to rework the line and set to work producing high-quality 1911’s at affordable prices. Para segments it’s offering into the Expert, Elite, Tactical, Competition and Executive lines. 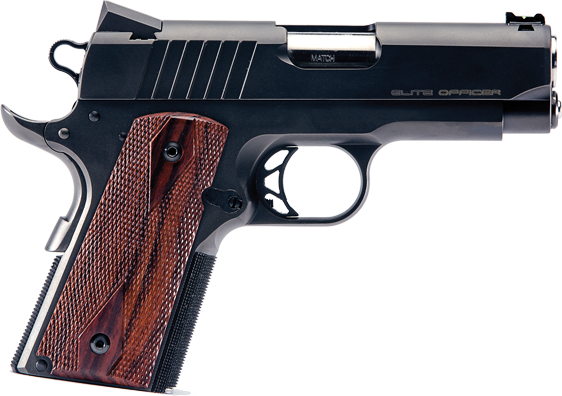 This officer pistol is part of the Elite line which fits into the mid-to-upper price range for their consumer pistols. The feature list is mostly self-explanatory, but a few things demand a bit more discussion. The EGW HD extractor is the Evolution Gun Works Heavy Duty extractor. It’s made from higher-grade steel than most standard 1911 extractors and seems to be a bit bulked up in all the rights places. The extractor looks like it will outlast the typical brass-pullers, but only long-term testing will bear that out. The IonBond finish is a real value on the Para. With most matte or blued finishes, holster wear sets in fairly quick. Many jump to stainless slides in hopes of preventing or at least delaying the characteristic wear marks – Para found a coating that should do the same job without having to be really shiny. The chart below illustrates how tough the finish is believed to be. We’ll holster and unholster this one several times per day over a few months to see if reality matches up to the marketing. The magazines that come with the pistol are typical OEM quality Check-Mate 7 round black 1911 magazines. We’ll test various ammo through the gun with these mags and compare with Wilson Combat and Kimber ProTac mags to get a feel for reliability. The front fiber-optic sight is green, but not as large as the TruGlo TFO sights. This is welcome as the TFOs are extremely bright in broad daylight and these have just the right amount of “glow” for a carry pistol. The gun does not “rattle” when shaken which indicates good fit in the internal parts. The slide-to-rail fit is excellent. Not so tight as to be a reliability concern for a concealed pistol, but not so loose as to affect accuracy. Barrel to bushing fit is also within expectations for a gun that is hand-assembled and fit. The bushing to slide fit is very tight which we discovered upon disassembly. This should keep the recoil spring and guide rod firmly in line preventing issues down the road. There are cocking serrations on the rear of the slide. They are aggressive in looks and feel. Griping the serrations is positive and comfortable. The serrations are angled to match the rake angle of the pistol grip and aesthetically pleasing. The mainspring housing and the front of the magazine well are both checkered leading a very positive feeling grip. Confidence can be had that even with sweaty hands, a good grip can be maintained on the firearm. The beavertail is an extended model which will prevent the ever-dreaded slide bite when firing. The match grade barrel is 1:16 twist with 6 rifling cuts. The “match grade” label refers to the tighter tolerances and 416 Stainless construction of the barrel which should offer improved accuracy over standard barrels. The trigger is a match-grade over-travel adjustable and skeletonized model. There is very little vertical or horizontal play in the trigger. Trigger pull was 6lbs straight from the factory with about 1/32 of an inch of creep between engagement and release of the hammer. The pistol comes in a formed plastic pistol case that holds the gun firmly in place. The box includes two seven round magazines from Check-Mate, a standard cable lock and, oddly, a barrel bushing wrench. Considering the bushing design of an officer model with one-piece rod and spring, the barrel wrench is not needed nor even usable. Para could have save a little money by not including it, but we’ll just add it to our collection of bushing wrenches for our other 1911’s. The manual is for a full-size 1911 with partial guide rod and standard bushing. The take-down instructions are incorrect for the officer model. This is a clear oversight by Para and should be remedied as the field-strip directions and inclusion of an unusable bushing wrench may confuse new owners. As with many single-construction guide rod and spring officer model 1911’s, takedown will seem odd if you’ve only take apart standard 1911’s. It’s not difficult once it’s been done several times, but can be challenging for those that haven’t owned an officer 1911. We found the weight and profile of the Para Elite Officer to be extremely comfortable when carrying both outside the waistband and inside. We tested with Galco’s Avenger high-ride belt holster, the Galco Summer Comfort IWB and Versacarry’s .45acp low-bulk holster. The suggested retail for the Para Elite Officer is $949.00, but we found it for $869 at The RAM Armory. Para offers a 100% lifetime warranty to the original retail purchaser of their pistols. Parts and labor are free of charge for any defect in workmanship or design. In the few dealings we’ve had with Para’s warranty service division, they stood behind this warranty without compromise. The Para Elite Officer looks to be an excellent carry option for those that prefer the firepower, reliability and styling of a 1911. Stay tuned for Part II where we take the Para Elite Officer 1911 pistol to the range for break-in, ammo testing and accuracy data gathering. Have you had any range time with this yet? Yes. I’ve got about 2,000 rounds through the gun so far and have been impressed. I need to set some time aside to pull together the grouping and handling info I’ve gathered into an article, but this is a great handling, reliable gun that isn’t picky about what I feed it. I’ll be sure, when running from FEMA, and the NSA, in fear of my life and freedom, to bring a paper clip with me…. Are you F#@KING SERIOUS? I have an 850 dollar pistol that can only be field stripped with a .03 cent paper clip????? It can be field stripped without the paperclip – but it certainly makes it easier with it. Its common with many other manufacturers to see the same type of process – and besides, the bull barrel set up far exceeds the reliability of the original bushing design from Colt. Something to remember when running from FEMA …… lol.